Medical marijuana can relieve pain and symptoms of certain age-related diseases, but misconceptions about it are preventing further research. Medical marijuana is back in the limelight due to the increased number of states that have legalized use of the plant as a possible alternative to pharmaceutical drugs that offer relief to people who suffer from chronic conditions. Several studies have shown that medical marijuana is an effective treatment for various illnesses, and many researchers believe there is a greater potential to expand its treatment to disorders such as Alzheimer’s disease, Parkinson’s disease, cancer, and post-traumatic stress disorder (PTSD). However, research is restricted by the Drug Enforcement Administration (DEA) classification of marijuana as a Schedule I drug, indicating that is has no medical value and is a danger to public health. This classification leaves researchers in the U.S. without the ability to conduct double blind studies and encourages the use of mice as test subjects. This article attempts to clear up many of the misconceptions about medical marijuana, such as addiction and harmful side effects. Additionally, it examines research findings that focus on chronic diseases most common among the 65 and older population, including Alzheimer’s and Parkinson’s disease, arthritis, cancer, osteoporosis, glaucoma, and depression. The article concludes with a discussion of the possible reasons behind the DEA’s decision to oppose the legalization of medical marijuana (cannabis). A main concern regarding the use of medical cannabis is the possible psychoactive effect, which comes from one of the cannabinoids (chemical compounds) found in cannabis known as tetrahydrocannabinol (THC). However, THC is only 1 of 100 types of cannabinoids found in cannabis (Rahn, n.d.). Another type of cannabinoid, cannabidiol (CBD), is a non-psychoactive molecule that has been shown to provide relief for an array of symptoms associated with pain, gastrointestinal disorders, and neurological disorders. Cannabinoids have different effects, depending on which receptors they bind to in the body. Both THC and CBD are not foreign compounds being introduced to the body, rather they imitate compounds that the human body naturally produces, called endocannabinoids. These compounds, whether endogenously produced by the body or supplied from the cannabis plant, once activated, are taken up by cells to maintain internal stability and health. Other concerns are the potential for addiction and harmful side effects from medical cannabis. The results regarding addiction from using marijuana are mixed. The worst side effects come from smoking cannabis with THC, such as dry mouth, dry/red eyes, nausea, dizziness, blood pressure problems, hallucinations, and impaired mental functioning. Prescription drugs, on the other hand, can be even more addictive than medical cannabis and are more likely to have harmful side effects. For example, a prescription drug called Razadyne (generic name: galantamine), used to treat Alzheimer’s disease related dementia, features a list of side effects that can be more serious than the condition being treated, including: seizures, black/bloody stool, vomit that looks like coffee grounds, abdominal pain, severe dizziness, blurred vision, depression, insomnia, and loss of appetite (American Society of Health System Pharmacists, 2017). Although such side effects might not be as serious for a younger, healthier adult, it can be the difference between life and death to an ailing older adult. 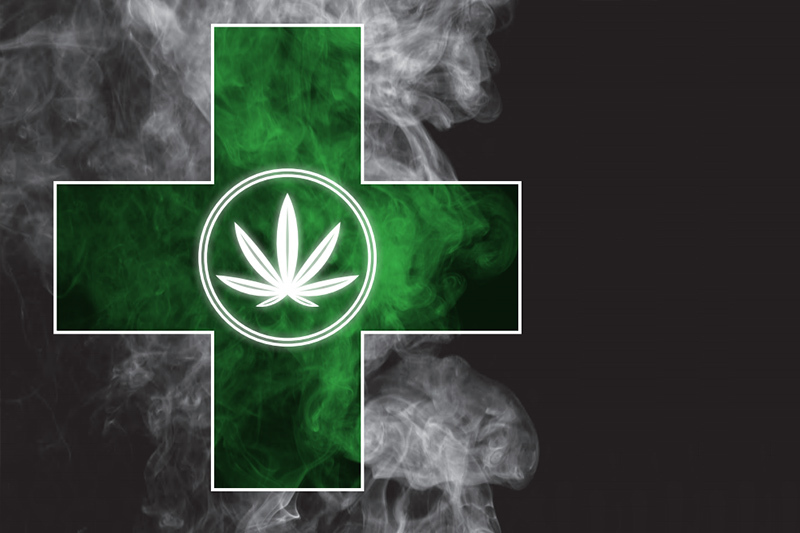 Possible side effects for medical cannabis are mild when compared to many prescription drugs and, as mentioned above, the THC compound that has possible psychoactive effects does not have to be used in medical cannabis; there are different compounds that can be used for medicinal purposes with less harmful side effects. In addition, medical cannabis does not have to be smoked; other options include taking it orally or using it topically. Across the nation, nearly 50 percent of older adults are taking upwards of 10 different medications to treat chronic illnesses, many of which are not medically necessary (Maher, Hanlol, and Hajjar, 2014). This phenomenon is known as polypharmacy. Polypharmacy increases risk of negative health outcomes, such as dangerous drug interactions caused by lack of geriatric education in medical schools and inadequate communication between physicians, as well as higher healthcare costs due to hospitalization from drug-related complications. One frequently overlooked polypharmacy consideration is that many prescription drugs act differently in older patients than younger ones. A drug that has a long half-life will last even longer in the older patient. With only 7 percent of physicians trained in geriatrics, this factor can be easily overlooked when prescribing medications to older patients. The Institute of Medicine study (2006) found that there were at least 400,000 preventable adverse drug events every year in hospitals, which increased annual health care costs by approximately $3.5 billion. So how might medical marijuana help to reduce the number of medications prescribed to older patients? Bradford and Bradford (2016) examined how implementing state-level medical marijuana laws changes prescribing patterns and patient expenditures in Medicare Part D for Food and Drug Administration (FDA)-approved prescription drugs. They found that in states where medical marijuana was legal, physicians gave out 4,593 fewer prescriptions for all conditions in the study (anxiety, depression, nausea, pain, psychosis, seizures, sleep disorders, spasticity), except for glaucoma, and 1,826 fewer prescriptions specifically for pain medications annually per physician. Other findings show that Medicare Part D spending, for both program and enrollee spending, fell by $104.5 million in 2010. In addition, the cost savings had risen to $165.2 million by 2013. Overall, they suggested that if all states had implemented medical marijuana laws, the total savings to Medicare Part D would have been $468.1 million. A review of current scientific studies shows that it is possible for medical cannabis to provide symptomatic relief to patients afflicted with Alzheimer’s and Parkinson’s disease and may moderate the progression of both diseases. Cannabinoid compounds have become potential therapeutic agents against Alzheimer’s and Parkinson’s disease because of their known multifaceted neuroprotective properties (Aso, Juves, Maldonado, and Ferrer 2013). So far, CB1 and CB2 cannabinoid receptors have been isolated for treatment because targeting them may reduce neuro-inflammation and impaired memory, without causing psychoactive effects (Campbell and Gowran, 2007). Overall, manipulation of the cannabinoid pathway offers an alternative approach for the treatment of Alzheimer’s disease that may be more effective than current treatment regimes. However, more research is needed to examine the long-term effects of medical marijuana on these neurological disorders. Older adults are more likely than younger adults to experience pain due to chronic conditions and many rely on prescription opioids for pain management. Medical marijuana has the potential to help block out discomfort because it binds to pain receptors. Currently, around 10 percent of Americans use marijuana to control pain (Bronstein, Dhaliwal, and Leider, 2011). A study of adults age 50 and older found that those living in states that allowed them to legally use medical marijuana had reduced rates of pain and less pain-related work interference (Nichols, 2016). Joints naturally produce cannabinoids, but over time with arthritis, their ability to do so declines. Injecting cannabinoids into arthritic joints can decrease some of the pain, inflammation, and joint damage caused by osteoarthritis (Biro 2016; Ruhaak, et al, 2011). Oral cannabinoids have been found to give minimal to moderate relief compared to a placebo in those with musculoskeletal pain, including rheumatoid arthritis and fibromyalgia (Biro, 2016). A review of 18 studies of the medical use of cannabinoids found that it was safe and modestly effective for rheumatoid arthritis and fibromyalgia (Lynch and Campbell, 2011). Medical marijuana has also been found to improve sleep, which is a common issue among those with arthritis. Marinol, which the DEA describes as the existing legal form of medical marijuana, was developed to alleviate cancer treatment side effects. Marinol is metabolized by the body very quickly and only 10-20 percent of the oral dose actually reaches systemic circulation. By contrast, medical marijuana that is smoked is rapidly absorbed by the body and more of the medicinal compounds actually reach the body’s systemic circulation. Marinol also has several precautions and side effects, including seizure disorders, adverse reactions for patients who have had heart problems, mental health problems, and issues with substance abuse (Mirinol.com, 2016). Trial studies have indicated that medical marijuana increases appetite and reduces nausea with fewer side effects. Osteoporosis occurs when the body makes too little bone, the body loses bone, or both. One in two women and one in four men will break a bone by age 50 due to osteoporosis (NOF. org, 2016). Cannabinoids play a key role in the metabolism of bone (Idris and Ralston, 2010). Medical marijuana injections could help stop bone loss due to osteoporosis, but few trials or research studies on its effectiveness exist. Glaucoma is caused by damage to the optic nerve due to increased eye pressure (National Eye Institute, 2016). Studies have found that medical marijuana reduces pressure inside the eye, relieving discomfort for three to four hours. However, other drugs currently available might relieve pain for longer. More research is needed. The research on medical marijuana and depression is still in the early stages and most studies are based on non-human subjects. Medical marijuana has been found to reintroduce cannabinoids into the brain of rats, which helps to replenish depletion and reduce chronic stress and depression. Views are mixed whether medical marijuana leads to depression or if it treats depression (Lev-Ran, 2014). Another concern about using medical marijuana to treat depression is that it may trigger psychosis in people with a higher risk of those conditions (Baker, 2010). More research is needed to determine if the benefits outweigh the risks and how to avoid high-risk populations. What’s Blocking Research that May Help Older Adults? Several organizations support medical marijuana such as the Institute of Medicine, American Cancer Society, and the American Medical Association. Additionally, in a 2015 Gallop poll, 70 percent favored making it legal for doctors to prescribe marijuana in order to reduce pain and suffering. With reputable organizations and a majority of people favoring making medical marijuana legal, why such opposition? One reason for this opposition is fear and misunderstanding about the consequences of legalizing medical marijuana, including making it easier for teens and kids to access the drug, driving while under the influence, and abuse. Studies in Colorado and Washington have shown that since medical marijuana was legalized, teen rates of use have been unchanged (Monitoring the Future Survey, 2015). In Colorado, there has been a slight increase in emergency room visits of children under age nine from accidental ingestion, however, emergency rooms and poison control centers are far more likely to see children who have ingested common household substances like laundry detergent or crayons (Washington Post, 2016). Safety precautions can keep kids away from medical marijuana, much like parents keep children away from flavored over-the-counter medicine. Furthermore, overall arrests for marijuana have declined significantly in those states, saving the system millions of dollars. Traffic fatalities have also remained largely unchanged, and one study found a 9 percent decrease after the legalization of medical marijuana (Anderson and Rees, 2011). Regarding the potential for abuse, Wallace (2015) recommends that patients should be monitored, and have routine follow-ups with prescribing physicians to assess progress with treatment. On the other hand, prescription opioids can be dangerous or even deadly for people of all ages. Currently, there are enough opioids prescribed each year to put a bottle in every household. Opioids can be dispensed as pills, patches, or a flavored lollipop. The rate of children hospitalized for opioid poisoning increased 165 percent from 1997 to 2012, and the rate of toddlers being hospitalized has more than doubled (NPR, 2016). Overall, opioid-related fatal poisonings have quadrupled over the last two decades (CDC, 2011). In 2010, prescription opioids were responsible for almost 60 percent (16,651) of all deaths due to drug overdoses in the U.S. ( Jones, Mack, and Paulozzi, 2013). By contrast, there has never been a reported overdose due to marijuana (medical or otherwise). Another barrier is marijuana’s federal classification. Marijuana is classified as a Schedule I drug—in the same class as heroin. This classification makes it difficult for any research to be conducted on the drug legally. In August of 2016, the DEA once again rejected the opportunity to reschedule marijuana to a Schedule II drug—a classification that would allow for more research. As Ingraham of the Washington Post explains, “The FDA has never approved whole plant marijuana as a drug… most drugs the FDA approves of are individual chemical compounds, not plants. Penicillin is an FDA-approved drug, for instance. The mold it’s derived from is not.” He goes on to say that, “… the DEA cannot change the legal status of marijuana unless the FDA determines it has a medical use. The FDA cannot determine it has a medical use in part because of the highly restrictive legal status of the drug.” Pharmaceutical companies also stand to lose profit from a change in marijuana’s classification. Insys Therapeutics, for example, is the maker of a synthetic THC drug and recently contributed $500,000 to oppose legislation in Arizona that would allow for full legalization (Washington Post, 2016). Some states have enacted their own laws on marijuana that largely support physicians’ standpoints that medical marijuana provides medicinal benefits for their patients. Other suggestions include keeping marijuana as a Schedule I drug, but create an allowance for medical marijuana research, or to amend the Controlled Substances Act. The miseducation about medical marijuana over the last 50 years has been detrimental to the progression of research into the effects it may have on countless diseases. With a rapidly aging population comes an increase in chronic disease. If there is a chance that medical marijuana is as effective and inexpensive as some recent studies have shown, and provides pain relief that curtails the national epidemic of prescription opioid overdoses, then people with these debilitating diseases deserve the option to choose medical marijuana as an alternative. However, until the DEA changes medical marijuana classification from a Schedule I drug, researchers will continue to face multiple hurdles in documenting the full scope of its benefits. Dr. Lisa Rill currently works as Research Faculty III at the Claude Pepper Center at Florida State University. Her research includes identifying ideal assisted living facilities, long-term care labor force issues, nursing home risk scores, Medicare/Medicaid, and universal design for senior housing. Dr. Lori Gonzalez is Research Faculty III at the Claude Pepper Center at Florida State University. Her research focuses on quality of care and quality of life in long-term care. Dr. Gonzalez has authored several works on the Green House Project and the Program of All-Inclusive Care for the Elderly. American Society of Health-System Pharmacists. (2017). Galantamine: MedlinePlus Drug Information. Retrieved from http://medlineplus. gov/druginfo/meds/a699058.html#side-effects. Anderson, D., and Rees, D. (2011). Medical Marijuana Laws, Traffic Fatalities, and Alcohol Consumption. IZA Discussion Paper No. 6112. Retrieved from http://medicalmarijuana.procon.org/view. timeline.php?timelineID=000026. Aso, E., Juves, S., Maldonado, R., and Ferrer, I. (2013). CB2 Cannabinoid Receptor Agonist Ameliorates Alzheimer-Like Phenotype in AßPP/PS1 Mice. Journal of Alzheimer’s Disease, 35, 847–858; DOI:10.3233/JAD-130137. Baker, A., Hides, L., and Lubman, D. (2010). Treatment of Cannabis Use Among People with Psychotic or Depressive Disorders: A Systemic Review. Journal of Clinical Psychiatry, 71(3), 247-254; DOI:10.4088/JCP.09r05119gry. Biro, T. (2016). SP0107 Cannabinoids and Inflammation: Focus on the Joint. Annals of the Rheumatic Diseases, 75, 26; DOI:10.1136/annrheumdis-2016-eular.6417. Bradford, A. and Bradford, D. (2016). Medical Marijuana Laws Reduce Prescription Medication Use in Medicare Part D. Health Affairs, 35 (7), 1230-1236; DOI:10.1377/hlthaff.2015.1661. Bronstein, K., Dhaliwal, J., and Leider, H. (2011). Rates of Inappropriate Drug Use in the Chronic Pain Population: An Update. The Journal of Pain, 12(4), P5; DOI:10.1016/j. jpain.2011.02.020. Campbell, V.A. and Gowran, A. (2007) Alzheimer’s disease: taking the edge off with cannabinoids? British Journal of Pharmacology, 152, 655–662; DOI:10.1038/sj.bjp.0707446. Centers for Disease Control. (2016). Depression is Not a Normal Part of Growing Older. Retrieved from http://www.cdc.gov/aging/mentalhealth/depression.htm. Centers for Disease Control. (2014). Leading Causes of Death. Retrieved from http://www.cdc.gov/injury/wisqars/leadingcauses.html. Centers for Disease Control. (2011). Vital Signs: Overdoses of prescription Opioid Pain Relievers—United States, 1999-2008. Retrieved from http://www.cdc.gov/mmwr/preview/mmwrhtml/ mm6043a4.htm. Institute of Medicine. (2006). Medication Errors: IOM Report. https://themgo.com/MGOPublications/QualityMatters/ MedicationErrorsIOMReportFall2006.aspx. Jones, C., Mack, K., and Paulozzi, L. (2013). Pharmaceutical Overdose Deaths, United States, 2010. Journal of the American Medical Association, 309 (7), 657-659; DOI:10.1001/ jama.2013.272. Lev-Ran, S., Roerecke, M., Le Foll, B., George, T., McKenzie, K., and Rehm, J. (2014). The Association Between Cannabis Use and Depression: A Systemic Review and Meta-Analysis of Longitudinal Studies. Psychology Medicine, 44(4), 797-810; DOI:10.1017/ S0033291713001438. Lynch, M., and Campbell, F. (2011). Cannabinoids for Treatment of Chronic Non-Cancer Pain; a Systemic Review of Randomized Trials. British Journal of Clinical Pharmacology, 72(5), 735-744; DOI:10.1111/j.1365-2125.2011.03970.x. Maher, R., Hanlon, J., and Hajjar, E. (2014). Clinical Consequences of Polypharmacy in Elderly. Expert Opin Drug Saf, January, 13(1); DO I:10.1517/14740338.2013.827660. Monitoring the Future Survey. (2015). Retrieved from http://www.monitoringthefuture.org/. National Eye Institute. (2016). Facts About Glaucoma. Retrieved from https://nei.nih.gov/health/glaucoma/glaucoma_facts. National Osteoporosis Foundation. (2016). Retrieved from https://www.nof.org. Nicholas, L. and Maclean, J. (2016). The Impact of Medical Marijuana Laws on the Labor Supply and Health of Older Adults: Evidence from the Health and Retirement Study. NBER Working Paper No. 22688. Retrieved from http://www.nber.org/papers/w22688. Rahn, B. (n.d.) Cannabinoids 101: What Makes Cannabis Medicine? Retrieved from https://www.leafly.com/news/cannabis-101/ cannabinoids-101-what-makes-cannabis-medicine. Ruhaak, L., Felth, J., Karlsson, Pernilla, Rafter, J., Verpoorte, R., Bohlin, L. (2011). Evaluation of the Cyclooxygenase Inhibiting Effects of Six Major Cannabinoids Isolated from Cannabis Sativa. Biological and Pharmaceutical Bulletin, 34(5), 774-778; DOI:10.1248/ bpb.34.774. U.S. Drug Enforcement Agency. (2016). Retrieved from https://www.dea.gov/druginfo/ds.shtml. Wallace, M. and Furnish, T. (2015). What Steps Should be Taken to Integrate Marijuana into Pain Regimens? Pain Management, 5(4), 225-227; DOI:10.2217/pmt.15.20. Washington Post. (2016). Colorado Gives Marijuana Candy a New Look to Avoid Confusion. Retrieved from https://www.washingtonpost.com/national/health-science/ colorado-gives-marijuana-candy-a-new-look-to-avoid- confusion/2016/09/30/34478cae-86e9-11e6-b57d-dd49277af02f_story.html. Washington Post. (2016). A maker of deadly painkillers is bankrolling the opposition to legal marijuana in Arizona. Retrieved from https://www.washingtonpost.com/news/wonk/ wp/2016/09/09/a-maker-of-deadly-painkillers-is-bankrolling- the-opposition-to-legal-marijuana-in-arizona/?utm_term=.bdec569e7654. A version of this article, Clearing the Smoke on Medical Marijuana: A Focus on Older Adults written by Dr. Lisa Rill and Dr. Lori Gonzalez originally appeared in CSA Journal Journal 68 - Volume 1, 2017.